Zubeen Garg, is well and popularly known by most of the people, especially by the people of Assam. 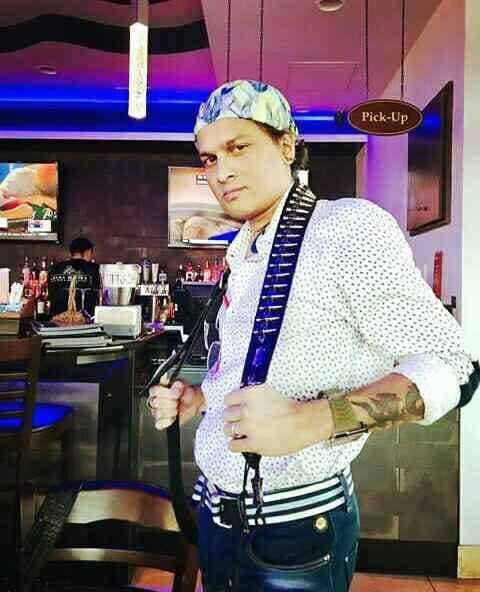 Zubeen Garg biography and his success story, shall be desperately known by the people in order to find out more about Zubeen Garg, as he is the significant icon of Assam's music. Before knowing about Zubeen Garg biography, the most important thing is to know who he really is. Generally Zubeen Garg is a singer, actor, musician, lyricist, composer, music producer, film director and a film producer. So dear friends, let us have a glimpse upon Zubeen Garg. Zubeen Garg, is not only a talented soul, but the sympathy and love he has for his people is the most interesting fact about him. Knowing about Zubeen Garg biography and his success story, will definitely make you love him more. He performs not only for himself but he dedicates his love to the people through all his performances. The speeches that Zubeen Garg gives each time, touches everyone's heart and mind. He never discriminates people on the basis of caste, creed, religion, rich or poor. He showers all his love equally to all the people. Below, we will come to know each and every detail, that one should know about a popular and kind hearted person. Zubeen Garg biography and his success story are been discussed below. Residence and Birth - The first and main thing that comes in Zubeen Garg biography, is when and where was he brought up. Zubeen Garg was born 18 November 1972. His place of residence is Jorhat, Assam. He was born with the name as Jiban Borthakur. He is the son of Ily Borthakur and Mohini Borthakur. He had a younger sister named Jonkey Borthakur, who confronted her unexpected death in the year 2002. Education - Zubeen Garg, completed his education life from Jagannath Barooah College, situated in Jorhat, Assam. Career and success - Zubeen Garg, was interested in the field of music from very earlier. He was born in a family, where most of the members had a singing career. He was greatly influenced by his mother Ily Borthakur. She was like an encouraging teacher to him. Zubeen Garg's real name was Jiban Borthakur. He transformed name after the name of Zubeen Mehta,who was a music composer and a great influential person to him. He changed his name after entering his singing career. The career and success of Zubeen Garg, took its path when he first performed a live playing a tabla, in the year 1992. He took the appreciation of huge people with this very performance. Later, all his performances took its way to an extreme level. Besides, he also plays various instruments like guitar, keyboard, drum, tabla, vocals. As a Singer, various popular albums were released by him which is still well known by a mass of population. Some of them were Anamika (1992) Pakhi (2007), Maya (2007), Mon (2015), Junbai (2015), Hori (2015), Mayabini Kumol Kumol (2016) etc. He gained his popularity and love among the people of Assam within a short duration of time. After gaining popularity in Assam, he started proving himself all over India by moving into the Bollywood music industry in the city Mumbai. Several Hindi albums and films, was then set down by him. Some of them were Yuhi Kaabhi, Raat, Fiza, Kaante. He was been approached to sing the song Ya Ali, by the famous music director Pritam, in the movie Gangster, in the year 2006. This was the most turning point in Zubeen Garg's life. His another album Zindagi, was also appreciated by many. As an Actor Zubeen Garg's roles in each respective films were breath taking, proving himself the best among all. He acted in several popular Assamese and Hindi films. Some of the Hindi films were Gangster (2006), Strings - Bound By Faith (2006), Big Brother (2007), As the River flows (2012). And some of the Assamese films were Tumi Mur Mathu Mur (2000), Dinabandhu (2004), Mon Jai (2008), Ekhon Nedekha Nodir Hipare (2012), Ramdhenu (2012), Suma Porokhote (2014), Ahetuk (2015), Rodor Sithi (2015), Gaane Ki Aane (2016), Hat Nomboror Hondhanot (2016), Mission China (2017), Priya Priyor (2017), The Underworld (2018). Zubeen Garg, also collaborated with various well known Musicians and Lyricists in some popular films in the past years. Some of them with whom he had collaborated were Pritam, in the movies Agnipankh (2004), Gangster (2006) Pyar Ke Side Effects (2007), Dum Maro Dum (2011) ; Shankar - Eshaan - Loy, in the movies Jhum Barabar Jhum (2007), London Dreams (2009) ; Anu Malik, in the movies Mumbai Se Aya Mera Dost (2003), Zindagi Rocks (2007), Mission Istanbul (2008) ; Vishal - Shekhar, in the movie I See You (2006) ; Sajid - Wajid, in the movie Hello (2008) ; Bappi Lahiri, in the movies Hangover (2010), Its Rocking Hard E Disco (2012), Latto (2013) ; A.R Rahman, in Micromax Unite Cricket Anthem (2015). Awards and Recognition - Zubeen Garg had won various awards as a Singer and as a Music Producer. Those prestigious awards were, Star Dust Awards (New Musical Sensation, Male) for the song Ya Ali, in 2006 ; Global Indian Film Awards (Best Male Playback Singer) for the song Ya Ali, in 2007 ; National Film Award for Best Music Director in 2009 ; Prag Sine Awards (Best Male Playback Singer) for the song Ahetuk, in 2015 ; Prag Sine Awards for Best Music Direction in the movie Rodor Sithi, in 2015. Personal life - Last but not the least, in Zubeen Garg biography, is a brief explanation about his personal life. Zubeen Garg is married to Garima Saikia Garg, in the year 2004. She is a fashion designer from Golaghat, Assam. Zubeen Garg made up his album Xixu, for the gloomy memory of his younger sister Jonkey Borthakur, who confronted her death due to a car accident in the year 2002. So, in Zubeen Garg biography and his success story, we came to know him in person, his family background and the way he achieved success very soon in his life. His albums are mainly of Assamese, Hindi and Bengali. Each of the albums and movies that we came to know in Zubeen Garg biography, are significant and popular. Zubeen Garg outstandingly holds up his culture in a way no can else can. He is an amazing soul inside and out. Ain't he ? I hope that today's blog on Zubeen Garg biography and his success story, helped many of you to add more new things and information, in your general idea about him that existed before. The main theme in every biographies of our blog, is to showcase the underlying talent in a person which changed themselves from ordinary to extraordinary soul. A sense of encouragement arouses, while writing a biography each time. I hope the same is and will be the case with you while reading it.